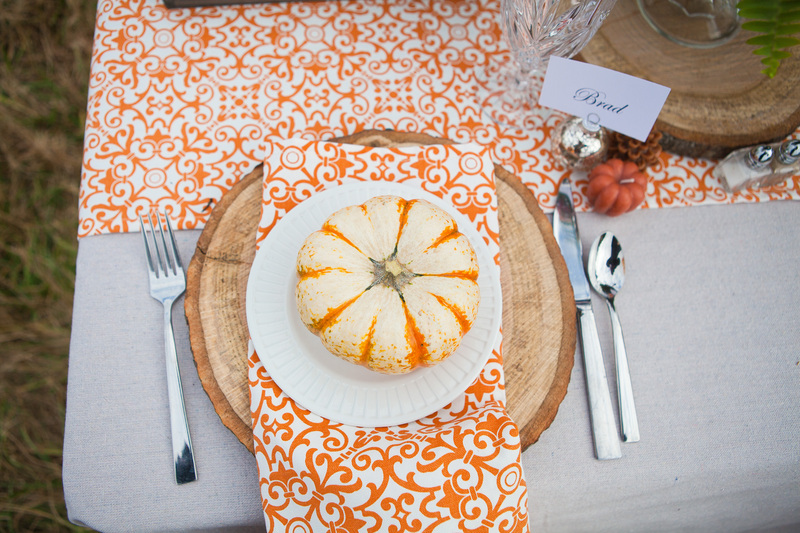 The week before Thanksgiving was a whirlwind but not for the reasons you’re probably thinking. I was not cooking away in the kitchen. In all my spare time, I planned and styled Urban Petals’ first photo shoot in just seven short days. It was an intense week but I managed to pulled this off with a little help from a beautiful bride, a handsome groom, a few dozen horses, wide open fields, and of course, a load of flowers… the result was worth all the late and near-sleepless nights! 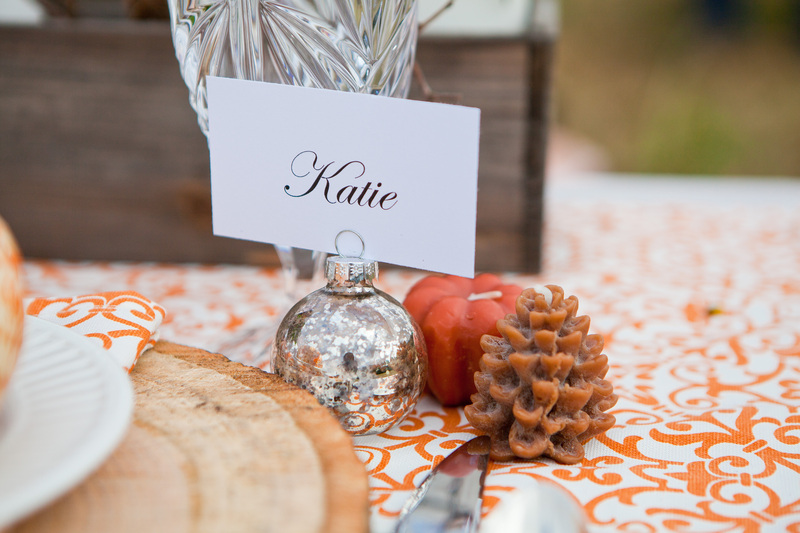 I hired Jodi Byrnes Photography to capture these images. Just a word to the wise if you live in South Carolina: Hire Jodi. Do it now. You will thank me later. She was really easy going. When she arrived she put all of us at ease and got right to work. I was so happy because she totally got my vision for this photo shoot. 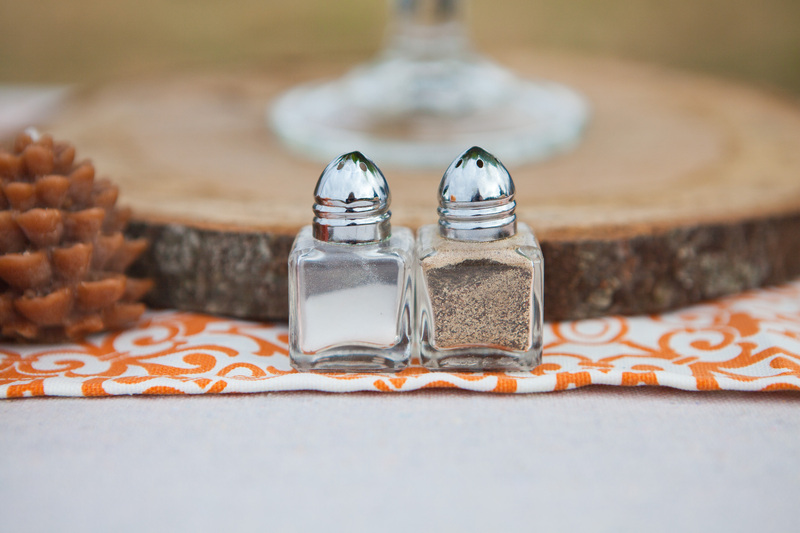 Details make or break an event. They can turn an “oh-that-was-nice” event into a spectacular and unforgettable event. Timing, color schemes, delivery, set-up, coordinating vendors, having the appropriate equipment and tools on hand, planning for emergencies and the unexpected are all important and basic details when you’re planning for any occassion. As I develop and grow my business in the wedding industry, I want to continue to strive to provide only the most detail oriented service. I hope you, my future clients, can trust that I will provide you with only the best service! 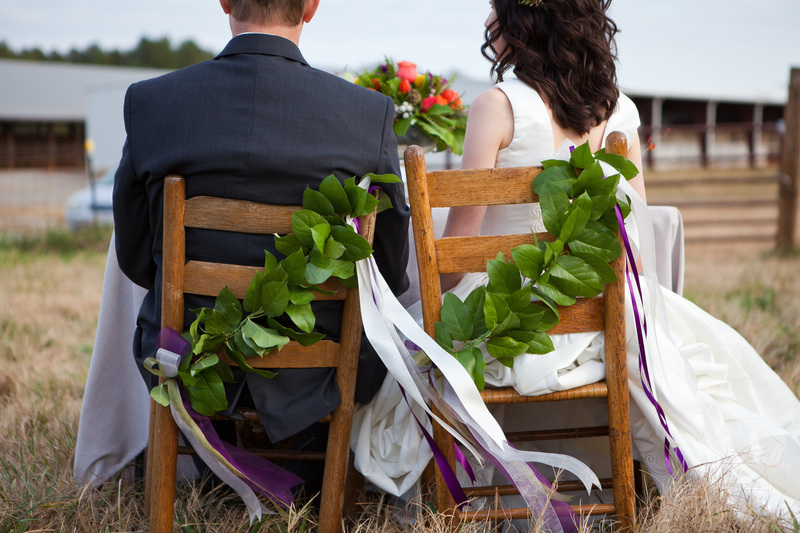 I will listen carefully to what your dreams and visions are for your big day. 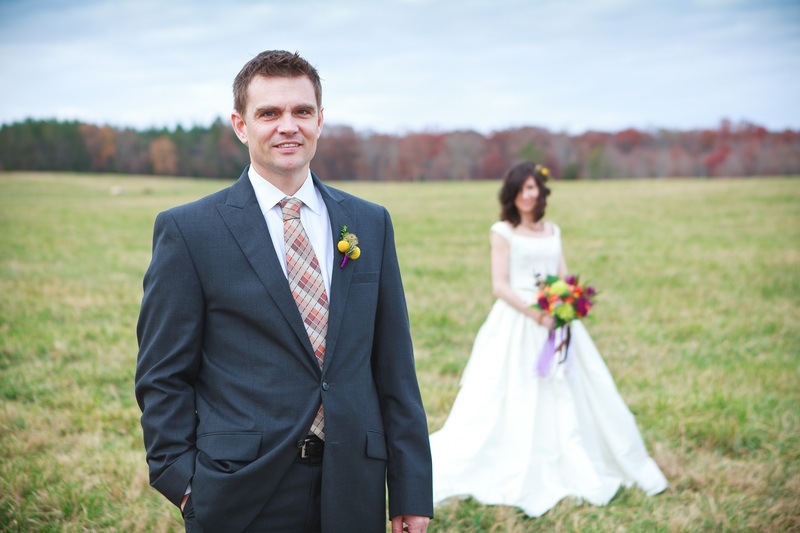 Whether your big day is a wedding, a family party, or a corporate event, I am here to help make your ideas a reality. I have to give a special shout-out to my models Katie & Brad, my friend Lee who let us shoot at the Double J Arena, Jodi of Jodi Byrnes Photography for these incredible pictures, and my dear husband who puts up with me & my hairbrained ideas and daily pushes me towards this dream! 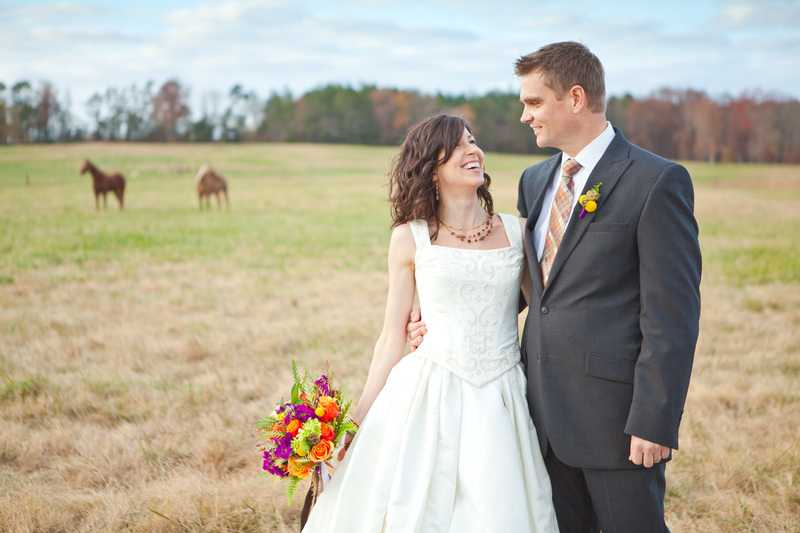 We had open fields, horses, hay, beautiful weather…. 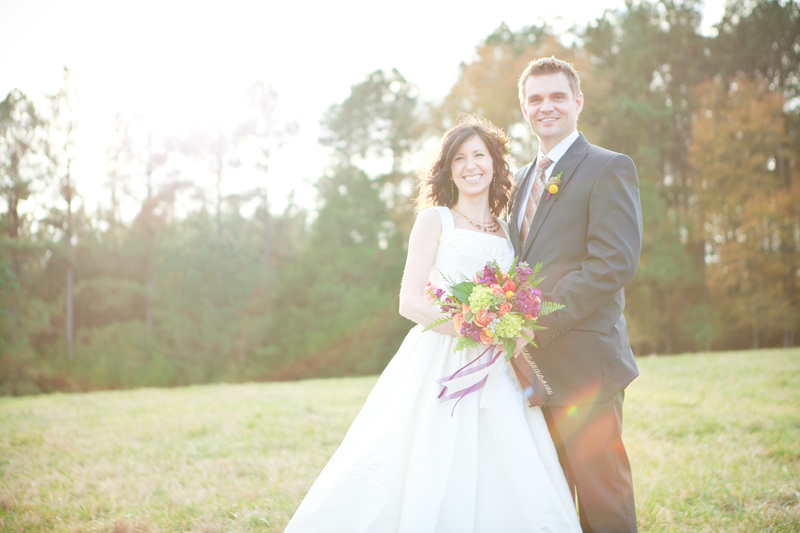 These two have been married for almost ten years, have two adorable kiddos AND she can still wear her wedding dress!! 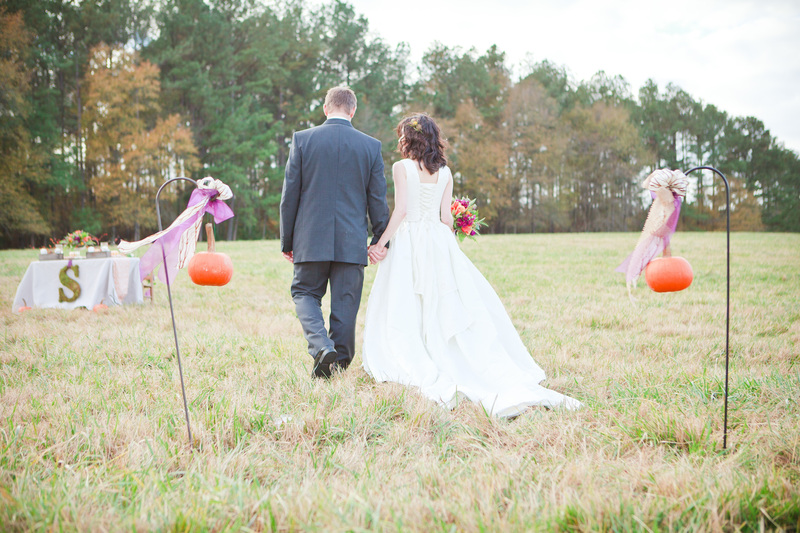 Brad & Katie were so kind and tried all sorts of crazy stuff so we could get these beautiful shots!! As I began planning the tablescape & design, I knew I needed an inspiration piece so I hand-selected the fabric you see below as my starting point. 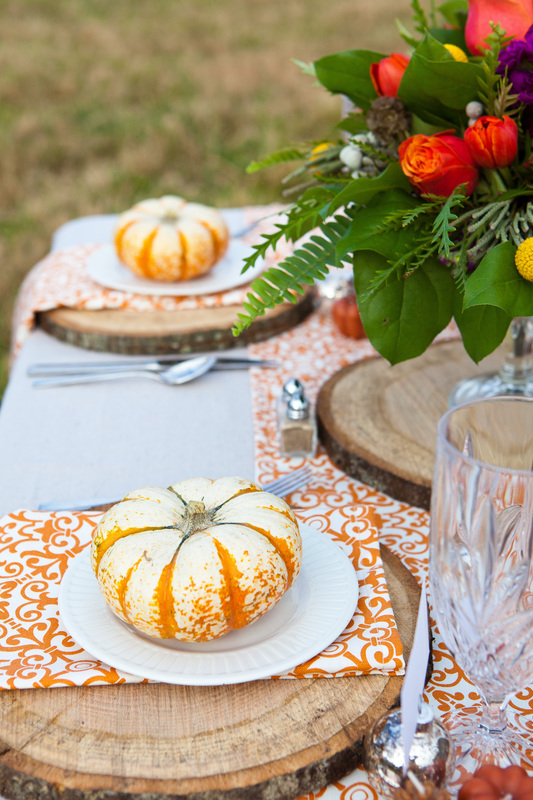 The custom-made linens were crafted just for this shoot. 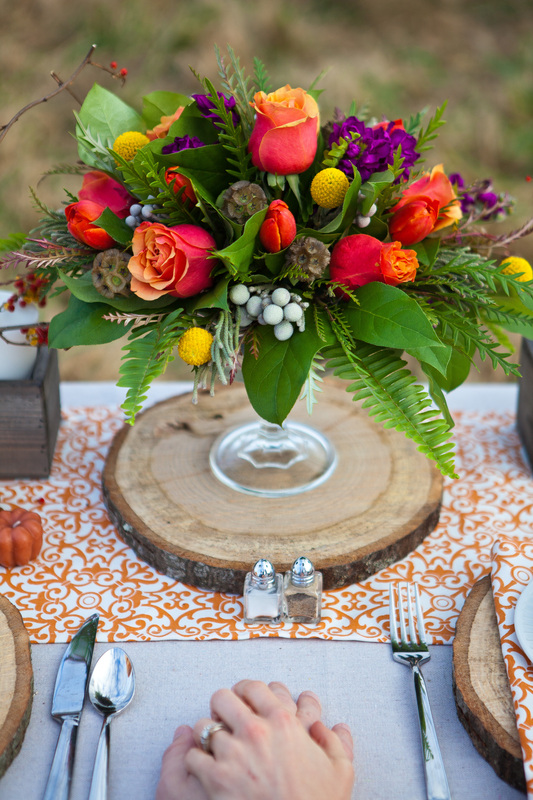 I love how the runner and napkins tied the the rustic wood and fall colors together. 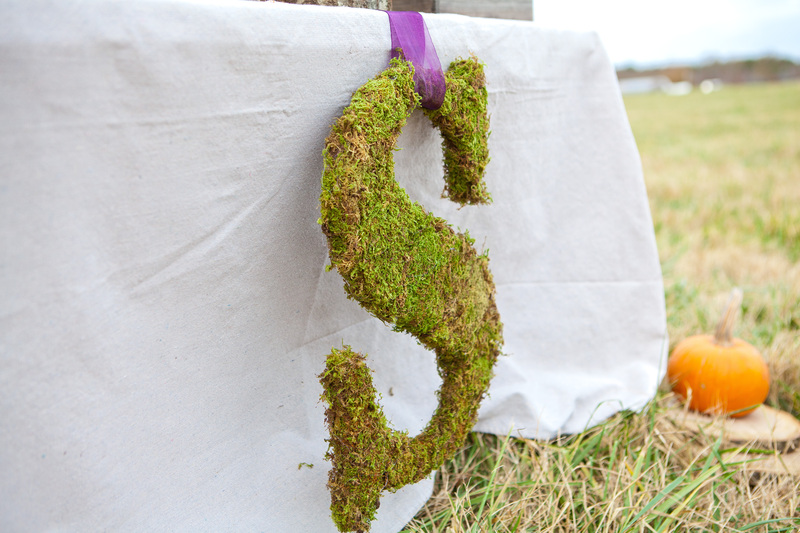 I have been dying to make a moss-covered initial for a wedding so I created one for this shoot. It was messy but relatively easy to make and I plan on making a bunch more in the future. Speaking of rustic wood, I thought these wood chargers turned out great! They were cut just for this occassion thanks to my husband and his brother’s handy-dandy chain saw. 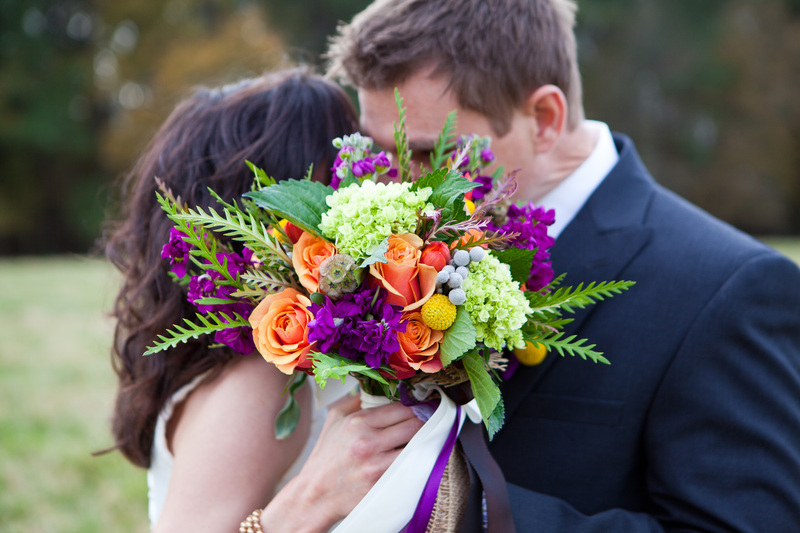 Ever wonder what florists mean when they say “personal flowers”? I did but it simply means flowers meant to be carried or worn. 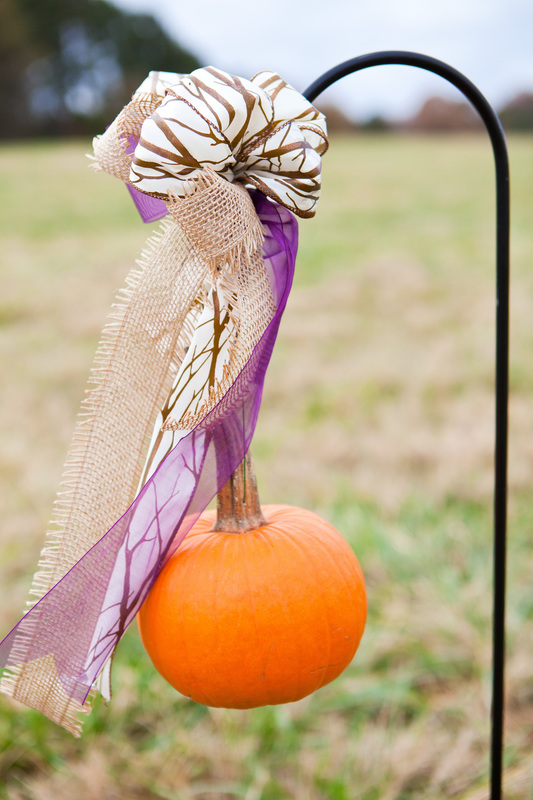 Boutonnieres, corsages, hair pieces, and bouquets all fall into this category. Below are two examples of personal flowers and I was so happy with the way they turned out! 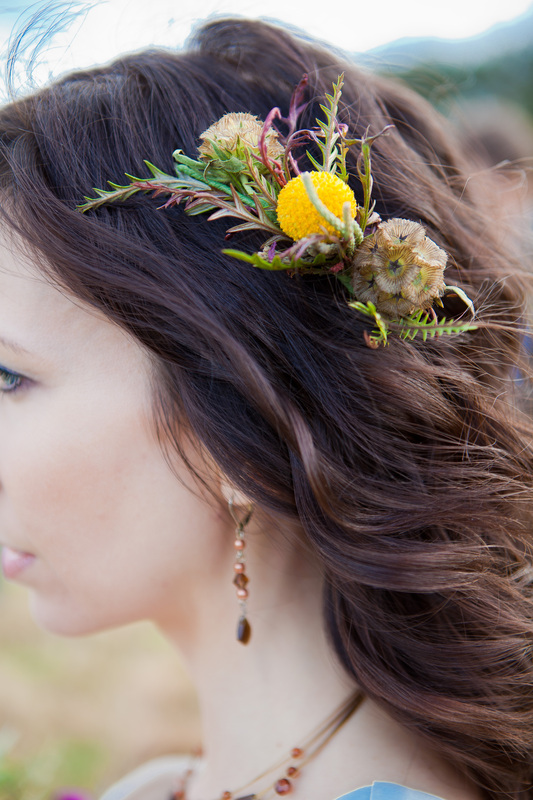 The bride is wearing a hair piece composed of scabiosa pods & craspedia. 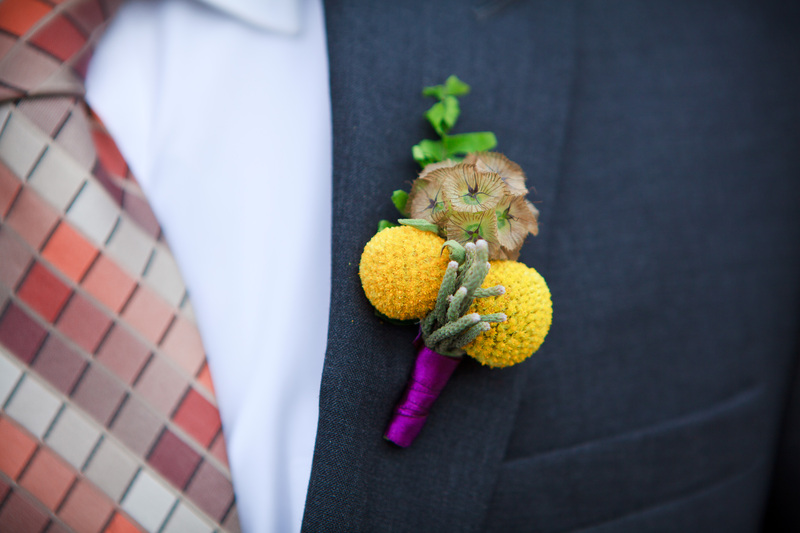 The groom’s boutonniere is also made out of a scabiosa pod and craspedia, but I added a touch of sword fern and silver brunia. How about that pop of purple to finish it off?! 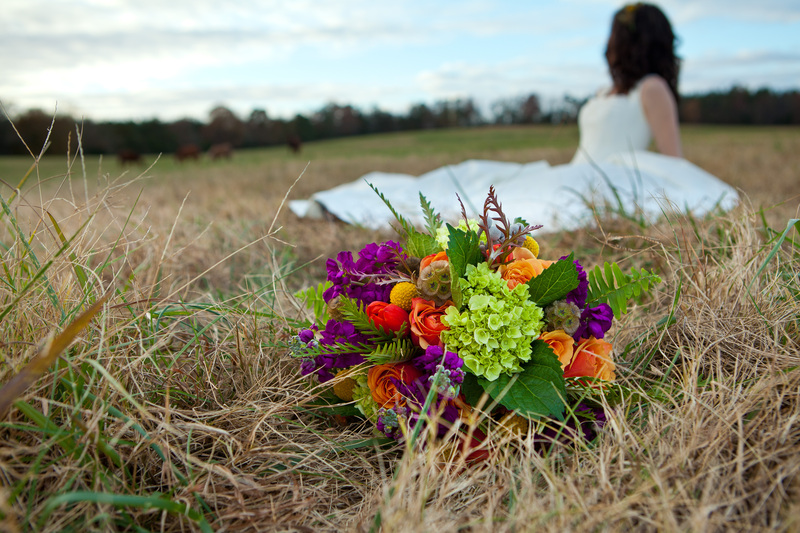 Here are a few close-ups of the bridal bouquet. I used cherry brandy roses (and boy! 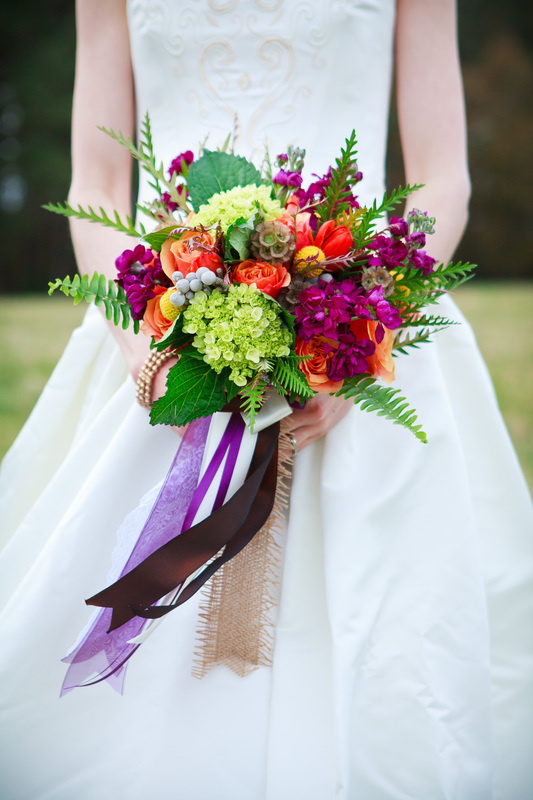 were they ever gorgeous), purple stock, orange tulips, yellow craspedia, scabiosa pods, sword fern and grevillea. And these two are living happily ever after.